Samsung’s QuickDrive washing machine is advertised everywhere this Easter week. You can’t switch on the TV or pick up a paper without spying it in Currys/PC World ads. So what’s all the fuss about? We’ve rounded up its key pros and cons. The unique tech packed inside the QuickDrive lets you monitor your washing while you’re away from home, and it’s designed to run quietly, too. We’ve tested the 8kg Samsung QuickDrive and the 9kg Samsung QuickDrive in our test lab. And there’s a review coming soon for the 10kg model. 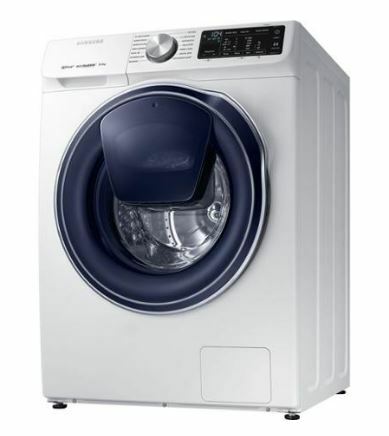 Although the Samsung QuickDrive is one of the smartest washing machines around, it’s not without its faults. Keep scrolling for the details. At the heart of the Samsung QuickDrive is the unique counter-rotating back drum panel. While the panel spins one way, the drum itself spins in the opposite direction – Samsung says it helps to move clothes around and gets your washing done in record time. Dyson was experimenting with a similar system back in 2000, but the machine it debuted on was discontinued in 2005. Samsung’s freestanding, front-loading washing machine also features a handy LCD display that serves up information on cycle options and washing times. You don’t have to worry about accidentally pressing a button on the panel mid-cycle, as you can ‘lock’ in settings when you’re happy with them. Parents washing baby clothes and cottons can try out the 30-minute bubble soak feature, which uses bubbles to loosen tricky stains. If you’re heading out of the kitchen and spot a stray sock on the floor, you can quickly chuck it into the washing machine by using the mini AddWash door instead of the main door. Gone are the days when you needed to be in the house to start and stop a wash. 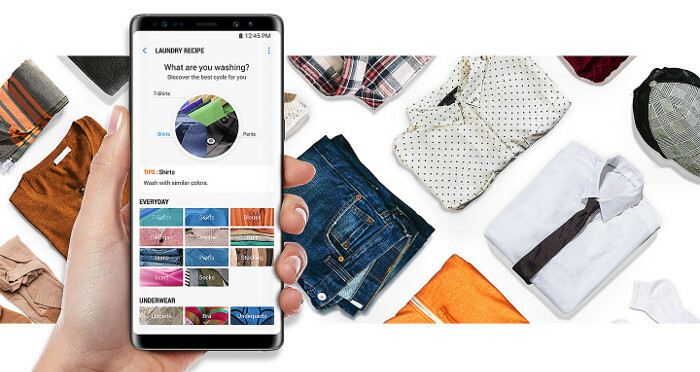 The QuickDrive partners with the Samsung Connect mobile app to let you manage the washing machine while you’re out and about. On your phone screen you’ll see start and stop times, recommended cycles and energy performance. It’s available for iOS and Android smartphones. Not every smartphone will be compatible with the tech, so we suggest checking the Google Play store or Apple App Store to see if you can run Samsung Connect. There’s also no guarantee of ongoing support for the software. Samsung says that its ‘ecobubble technology’ keeps the QuickDrive running efficiently. Bubbles form as the water mixes with your detergent, and those bubbles seep into your clothes, which means you can wash at lower temperatures. That option may appeal if you want to be kind to the environment, but our own tests found that the QuickDrive isn’t efficient with water. 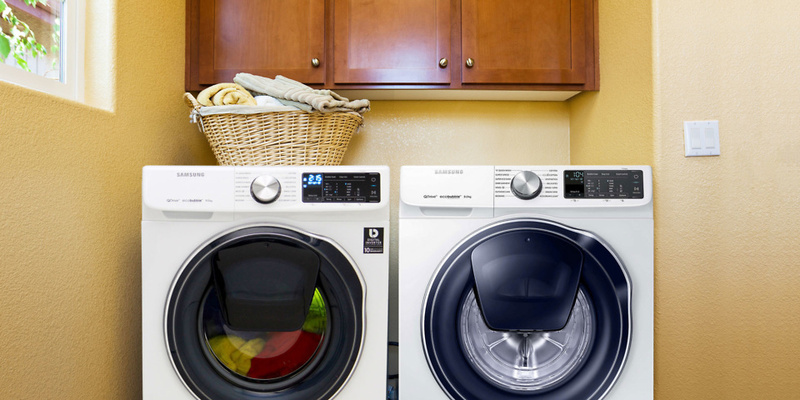 As of December 2013, the lowest energy efficiency rating a new washing machine can have is A+. When it comes to measuring running costs, we focus on the popular 40°C cottons program – and we’ve found A+++ machines that cost more to run than machines rated as A+. Samsung says that you’ll enjoy a ‘peaceful wash’ with the QuickDrive, thanks to its Vibration Reduction Technology. However, we thought the noise levels were only average during our testing, so if you’re after a super-quiet machine, you might want to look elsewhere. The technology packed inside the QuickDrive aims to speed up washing times, but our tests have spotted plenty of quicker alternatives. The 8kg QuickDrive took more than 3 hours to run a 40°C cottons wash program in our lab – not bad, but not the best around. Samsung says it can halve the time you spend on laundry, but that claim is based on a 5kg wash. See our full review for more details on washing times. Each washing machine that passes through our test lab is subject to our rigorous expert tests. The best models we’ve tested treat you to top-class cleaning every wash, and they’re easy to use. But it’s not all good news – our Don’t Buy washing machines are plagued by noisy drums and can fail to remove tough stains. Our testing has uncovered plenty of models that outperform the QuickDrive line-up, and in some cases they’re beaten by washing machines that cost half the price. To see which washing machines have topped our tests, head over to our washing machine reviews. Unsurprisingly, Samsung’s smart washing machines don’t come cheap – the latest QuickDrive model that we’ve tested will cost you around £900. If you’re planning to buy it, keep your eyes peeled for tempting sales over the Easter weekend, and be sure to check our expert reviews before parting with your money. We’ve tested the latest and greatest washing machines from big-name brands including Beko, Bosch, Hotpoint and Indesit. After collecting feedback from thousands of Which? members, we’ve uncovered the washing machine brands that are most prone to breakdowns and developing faults. Too see which washing machine brands we recommend, read our guide to the most reliable washing machine brands. Which washing machine should you buy?